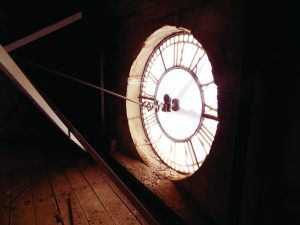 There’s a plan in the works for the Woodford County bell and clock tower, and, let’s just say it’s about time. Tipsword is a warden of the courthouse; as is everyone in his department. 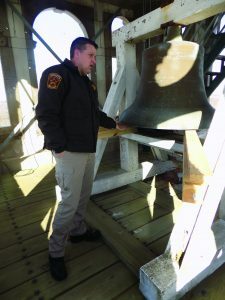 Caring for the courthouse, the bell tower and its clock, are part of the sheriff’s job description. It’s been more than a decade since the clock kept the time, or the bell rang the hour. The courthouse was built in 1897. The bell, forged in 1904 by Meneely & Co. Of West Troy, N.Y.,was added almost a decade later, along with the clock. E. Howard Clock Co. of Boston made and installed the clock. Now, the clock needs replaced and so does the bell hammer. The wooden housing for the one-ton bell needs to be replaced and the lights behind the clock faces are too dim. The Sheriff’s Department has the money for the bell repair, but not the clock. The total for repairs is $46,000. Half of the deposit, $12,000, has been paid from an asbestos removal grant that will pay for the bell to be fixed. The clock repairs are secondary, Tipsword said. 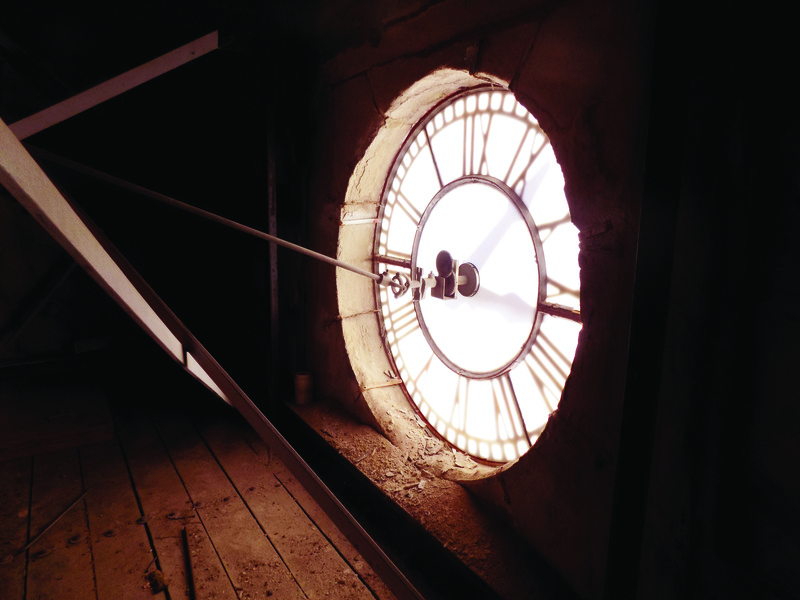 A few decades ago, the dome underwent restoration and the floor supporting the massive clock was repaired, as well. But the bell remains dependent on an assembly of rotting wood that must be replaced. Funding for the clock will have to come from the community. The clock was modified in the 1960s to operate electronically, rather than electrically, but stopped working properly. All four faces tell a different time. Smith is chairman of the Woodford County Zoning Board, and is responsible for bringing attention to the county’s aging clock tower. It’s Smith’s goal to have the bell and the clock running together, as they were first intended. Smith is encouraging local businesses as well as citizens to help fund the clock repairs. Donations may be made to the Woodford County Treasurer, 309-467-4621.